The Lunar Chinese New Year is just less than 3 weeks away, are you feeling the festive mood yet? If you are not, we definitely are! This is the time where we all start to gear ourselves up in terms of Chinese New Year Goodies (of course not forgetting Pineapple Tarts) and Chinese New Year Decorations. Besides getting for our own families, we do gifting of goodies to our family and friends as well. If you do not already know, the salted egg potato chips / fish skins are the hype and craze now! These snacks are extremely flavorful and highly addictive. They are as hot as how fidget spinners were a year ago! And what is even more mind-blowing is that they are definitely not wallet-friendly. A small packet of salted egg chips can cost anywhere from S$6 to S$8 where bigger bags can go up to S$20! They are so high in demand that they are mostly sold out by the end of the day. 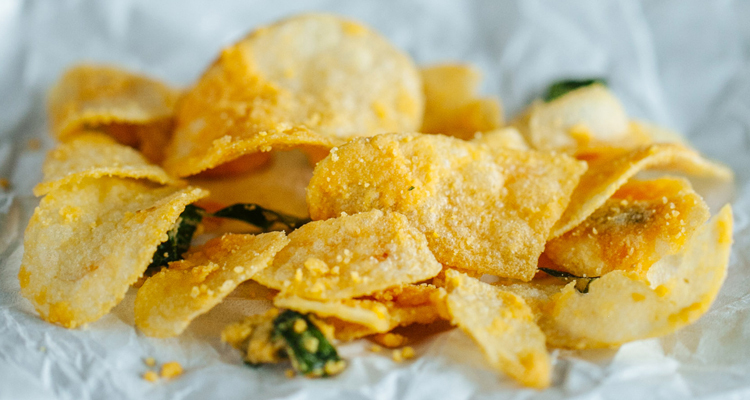 As salted egg potato chips / fish skins fans ourselves, we have experimented with more than 10 different recipes and finally came out with our very own. So if you want to enjoy this highly sought-after snack while not burning a hole in your pocket, you can try making it with our simple recipe! If you are using fresh potatoes instead of ready made potato chips, thinly slice the potatoes and soak in a salt water mixture for about 2 hours. Each slice should not be thicker than 2mm. Carefully separate the salted egg yolks from the whites and ensure that no white is left on the yolks. Steam the yolks for 15 minutes until they are fully cooked and light orange in color. You can wash and rinse your curry leaves while the yolks are steaming. Once the yolks are cooked, mash them with a fork. Note that you do not want to mash them too thinly as there should be chunks of salted egg with every bite of your chips. Deep fry the cut potatoes in a pan for 1-2 minutes over medium heat until golden brown and crispy texture. After which, drain the oil on the potatoes using paper towels. If you are using potato chips, you can skip this step. Using medium heat, melt the butter in a pan. Once the butter starts to bubble, add in curry leaves, salted egg, salt and sugar. Fry until they are fragrant and well mixed. At this stage, the paste should be slightly dense and creamy. Add in the potato slices / chips into the paste and toss till they are all evenly coated. After which, turn to low heat and cover the wok to continue letting the paste simmer together with the chips. This is to better allow the flavors to be absorbed into the chips. There you have it, delicious salted egg chips. With these simple steps, you can apply them to all kinds of other snacks besides potato chips. Fish skins are another popular option too! Hope you have enjoyed reading and Bon Appétit!